Here it is, wildlings! 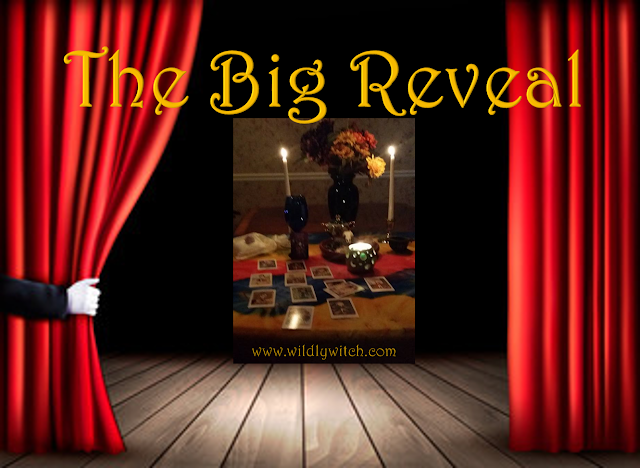 The Big Reveal! If you haven't done so already, please go to the Facebook page, and select your card. For those who already have, let's get to it! 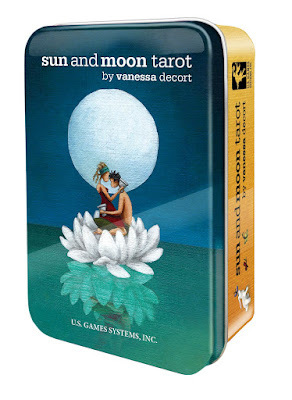 "By playfully incorporating mythology and astrology, Vanessa Decort brings unique interpretations to traditional tarot, presenting a deck that is both insightful and accessible. The Sun and Moon Tarot follows the traditional structure of Crowley Thoth Tarot. The Minor Arcana features Crowley’s key words at the top of the cards, with the card titles and numbering at the bottom. Major Arcana cards show the associated Hebrew letter in the artwork. 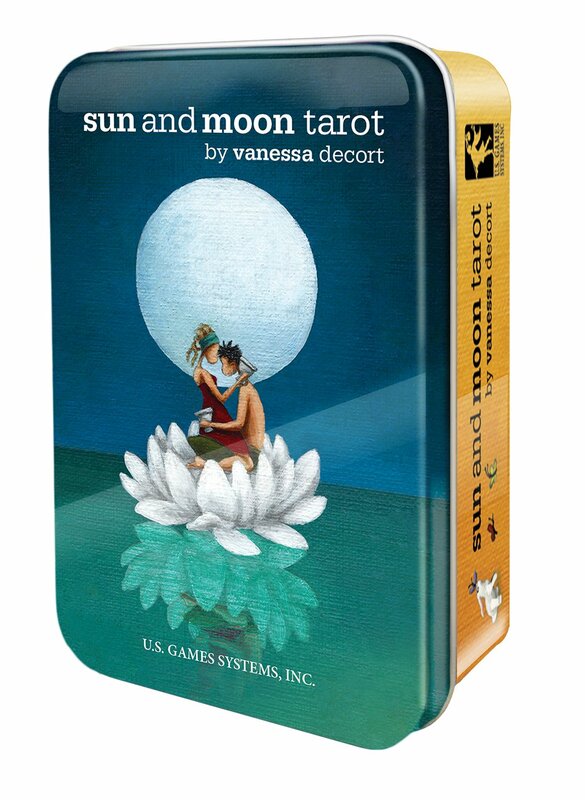 Sun and Moon Tarot is a multi-cultural tarot deck with symbolism borrowed from Hinduism, yoga, ancient Egyptian and classical Greek mythology, the I Ching, and Runes. The instruction booklet includes astrological associations and explanation of the Hebrew letters, as well as card meanings. 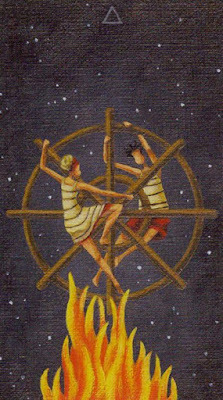 Sun and Moon is a interesting and appealing tarot deck." 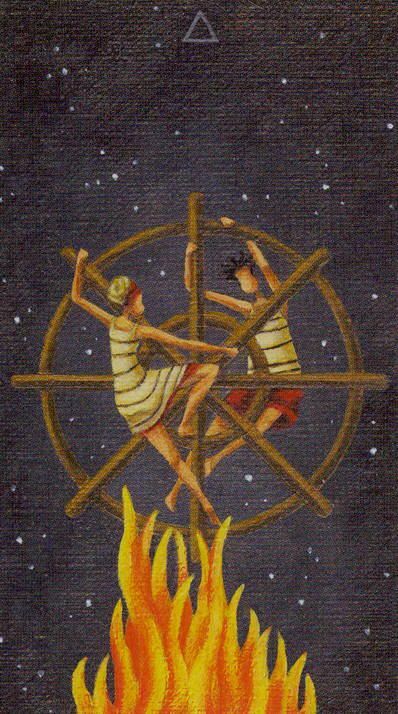 In general, the Four of Wands represents happy families, celebrations, surprises, parties, weddings and events. It signifies coming home and reunions, feeling like you fit in, and are made to feel welcome and supported. This Minor Arcana card indicates success, prosperity, stability, security, and laying down roots. It tells you that you will be proud of your achievements and that your self-esteem will be high. It also represents teamwork, community spirit, and communities or families coming together. Business is also likely to be going very well at this time, you will be proud of yourself, and others will be proud of you. Although this is a very welcomed card in a reading, it shows also a need to keep your wits about you. Although you deserve, and should, treat yourself to some fun, know that you are still in a building phase, and now is not the time to rest completely on your laurels. This card can also sometimes mean that you will be moving your place of residence. Key words: Happy families, reunion, coming home, celebrations, surprises, parties, weddings, events, feeling welcome, community or family coming together, community spirit, teamwork, success, prosperity, stability, security, laying down roots, pride, self-esteem, being proud of achievements. 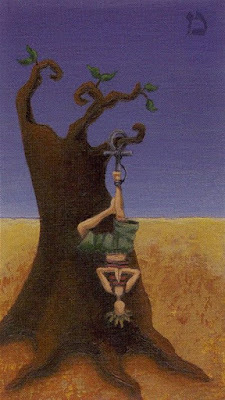 In general, the Hanged Man Tarot card indicates that you are in a situation that you are not happy with. 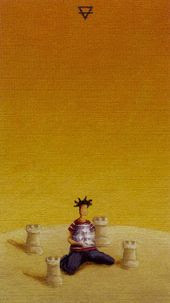 You may be feeling like you are stuck in a rut, or trapped in a situation/frame of mind that is not making you happy. Know that you have the power to release yourself. This may involve walking away from the situation,or simply changing your perspective on it. The Hanged Man may also signify that you may be facing a dilemma, and are unsure of which path to take. You may feel that things are not turning out the way you planned. Step outside yourself, and look at your situation from a different angle. Give yourself time to just relax, stop trying to control things, and just let them be; the correct course of action will become clear to you, in time. Remember, Odin hung on a tree for 9 days, in order to learn and share the knowledge of the runes. Key words: Feeling trapped, confined, self-limiting, uncertainty, lack of direction, needing release, letting go. In general, the Four of Pentacles Tarot card can indicate that you are holding on to people, possessions, situations, or past issues. It can be an indication that there are deep seated issues affecting you that you need to process and let go of. This Minor Arcana card can indicates that you may be trying very hard to cling onto the people or possessions that give you a sense of security. You may be holding onto things in an unhealthy, possessive, controlling or toxic way or someone may be holding onto you in such a manner. It can indicate that you need to establish your boundaries, or respect the boundaries of other people. The Four of Pentacles can also indicate a lack of openness, blocking, or obstructing progress, keeping to yourself or a sense of isolation. It can represent wealth, greed, materialism, and penny pinching. In a spiritual context, the Four of Pentacles indicates that you may be holding onto the past, and resisting going forward on your spiritual path. Fear, regret, or a sour worldview may be holding you back; and you may be closing your heart off to others, or focusing too much on materialism. If this is the case, take time out to figure out what you are holding onto, and why. Meditation, or just a walk in nature (leave your phone off) may help expedite this process for you. Key words: Holding on to people/possessions/ issues, deep seated/past issues, hoarding, stinginess, control, possessiveness, financial stability, financial security, saving for big purchases or retirement, greed, materialism, wealth, penny-pinching, isolation, boundaries, keeping to yourself, lack of openness. 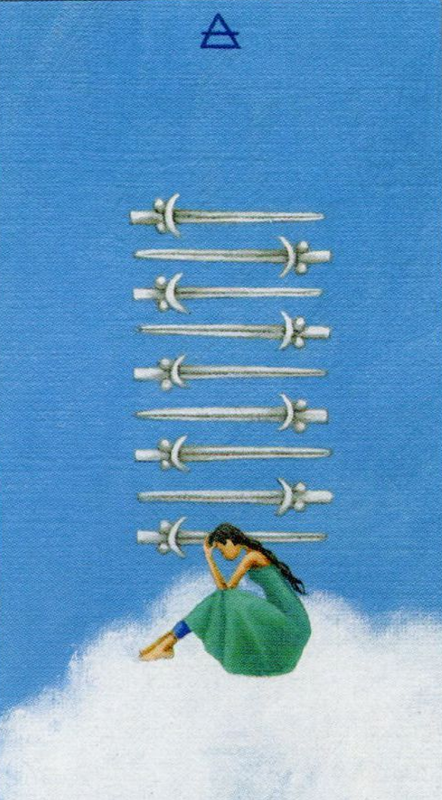 The Nine of Swords underscores the stress under which you are currently afflicted. A recent death or loss can bring this card about as a manifestation of your inner pain. The swords pointing off the card here reinforce that no firm direction is known when one is lost in agony. The Nine of Swords is another of the fear and anxiety cards in the Suit of Swords. Similar to the other fear cards, this card is not an indication of negative events actually happening, just that your fear and anxiety levels are so high they are making you feel that things are worse than they are. In short, you may be making mountains out of molehills. It represents stress, burdens, negative thinking and deep unhappiness. You will be feeling overwhelmed. and unable to cope with or face situations, problems, and may have reached your breaking point. It is a Minor Arcana card of mental anguish, remorse, guilt, regret, joylessness, and despair; and you may wish you could go back in time and re-write the past when it appears. It can also signify feeling isolated and being the subject of gossip. It can represent nightmares, and insomnia. If this represents you, and you do feel you are at your breaking point, seek counseling or help from a trusted friend or adviser. You are not alone, and there are resources to assist you. If you need help finding them, please reach out to me, privately. I will keep it completely confidential. How did you do? Not all Tarot readings will be what you desire. Sometimes, we have to face the hard stuff, in order to grow. As today is a dark moon, it's a perfect time to banish the things we no longer want or need in our lives, and that may actually be prohibiting us from growth and a healthy life. Post your comments on the Facebook Page (or private message, if you prefer), and let me know how I can further assist you.